Given up trying to pack the children off to uni, agree with boss to build a new extension, or clear the garage or loft out (how can you get so much stuff into them? And where did it all come from?). Decided on a small n gauge just so I could run things, last one was a OO Inglenook, no scenery whatsoever, pure shunting fun. Few bits of platform and tunnel mouths to give me an idea of placement. Last edited by NEvans on Sat Sep 15, 2012 11:13 pm, edited 2 times in total. So what shall I call this? Not really based on any station or area, how's about naming it after my nickname at school, never worked out why they called me a village though? 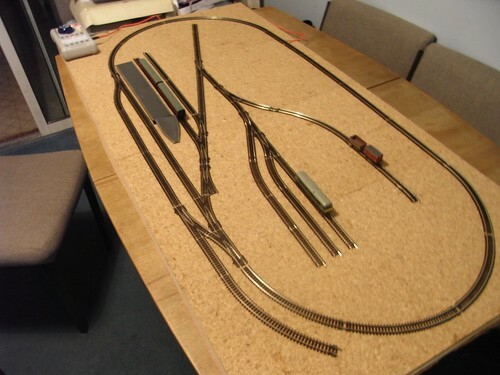 Image above shows two weeks of playing with the track I have, with more might be able to fit a hidden siding on the back straight and maybe small siding at front. Might still have a bit more playing before nailing anything down. Kid's have loved watching me spending hours each night moving bits of track around. Initially loved the idea of a very basic layout and working on my [lack of] scenic experience. But the more I look at it the more I like the idea of having lots of track to be playing trains on. Board; MDF with Softwood. Wife drilled holes and screwed and glued for me, didn't trust me indoors with things like that. Daughter glued felt strips on bottom of softwood, she didn't trust me with the glue either. They have both have seen the damage I've done over the years of my RC Planes with glue. They then glued cork tiles over it, the Wicks 1' square tiles come in a pack of 9 and fitted very well. First question; would you paint the whole board before going any further, and if so what colour? Enjoying this thread. Thank you. Although my layout is OO, I am interested in N gauge because it seems to me that it would be a very good bet for having a continuous layout in a reasonable space, with larger locomotives pulling a reasonable length train. My instinct would be to paint the board with either a grass-green or a brown. By painting the board you help protect it from moisture, but can also help disguise gaps when you do the scenery. I used MDF for my baseboard top, and painted it a light brown using an acrylic gloss. I understand that MDF is a bit sensitive to moisture if not protected. Plywood may well be less likely to expand or distort with changes to humidity or when you stick things to it (e.g. ballast or grass) with diluted PVA, but it is nice to feel safe. I would paint the base in some sort of earthy tone whether its a brown or green. It looks a whole lot better before the scenery goes down. I did my track bed grey and the rest of the board a natural looking green. but that suggests a very big mill somewhere, the other is Northford which would need a river and bridge somewhere for the name to fit. thus freeing up the main line for traffic while the passenger train is stopped in the station. And if you can take the passing loop round the RH curve. So you can run longer trains say three or may be even four coaches. Board is now painted a grey'y (is that an actual word? probably not) brown. The station is only temporary like that, probably get a card one for a better fit later. The idea of putting it there is so there is a bay platform from which the trains leave from and return to. I did think about a second platform more to the bottom right as you suggest but thought there is an issue when wishing to un-couple to shunt or run engines round. 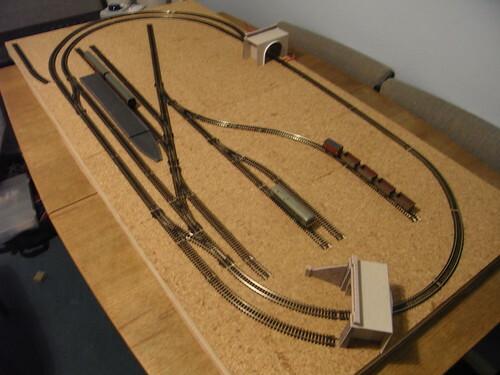 I still find it fiddly, maybe it's because I'm new to N.
Currently track is lifted and board put away so it was out of the way while I was off with work, already got new thoughts for it slightly different setup, I agree with making the passing loop longer. I'll try and get some pics later. Continued the twin on left so can run two trains happily, but still need to think due to down to one line, haven't decided if going to hide track as shown by the true tunnel mouths, or mabye across the left hand side with station above and bridge down to platform.